Despite regular reports that Google's Android platform has passed iPhone 4 in both installed base and growth, Jeff Tribble of SEO firm ROI365 notes that the firm's analytics data covering 4 million unique visitors across a large portfolio of web sites actually reveals that Android's share of web visits over the iPhone "is very slight and has not grown much over the past quarter." Tribble reported that his collective data "currently show 2.89% of the visits coming from Android vs 2.62% coming from iPhone. In December we showed 2.05 for Android and 2.01 for iPhone. But this is not an apples to apples comparison," he noted. "The Android stats are for the total platform while iOS stats are broken out into 3 categories, iPhone, iPad and iPod. Android has never come close to passing iOS as a whole," Tribble reported. "Our iOS visits are currently 4.97%, up from 3.8% in December. If you exclude iPod (which is slightly declining) our visits are currently 4.16%, up from 2.94% in December for a growth rate of 41.5% which is slightly higher than the Android platform growth of 40.98%. "So while the entire Android platform with all of their partners, models, phones and tablets has outgrown the single iPhone 4 by 40.98% to 30.35% the past 4 months, iPad is outgrowing the entire Android ecosystem so significantly [that] it more than makes up for the iPhone deficiency plus some. And it just launched 3 weeks ago and millions of people who want them can't get their hands on them yet." 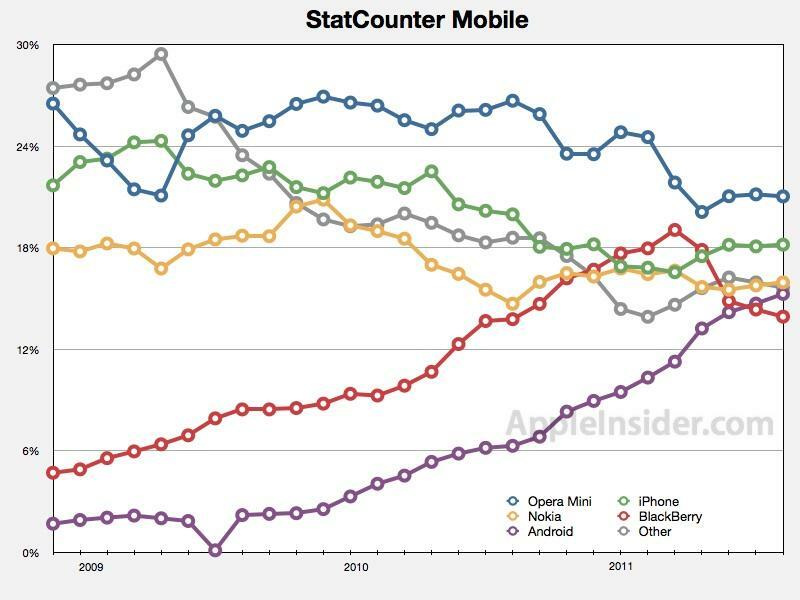 Parallel figures from StatCounter Mobile indicate that Apple's iPhone has lost web browser share since the end of 2008 in the mobile space. However, Mobile Safari has grown from third place to second behind Opera Mini following just over two years of changes in the smartphone arena. According to StatCounter Mobile, Android's browser has never come close to exceeding iPhone browser use, even before including iPod touch or iPad users. The use of "other" web browsers has fallen significantly as users have settled upon one of the top five mobile browsers: Opera Mini, popular among many feature phones (and also available for every mobile platform, including iOS, Android and BlackBerry); Apple's Safari Mobile iPhone browser; Nokia's third place WebKit browser; Android's fourth place WebKit Chrome browser; and RIM's fifth place WebKit BlackBerry browser. Note the StatCounter's figures separate out iPod touch and iPad users, so its numbers described here only represent iPhone Safari users. The firm tracks 15 billions hits across three million sites every month. Apple's Mobile Safari, which dramatically raised the bar in mobile browsing when it first appeared on the iPhone in 2007, is down just 2.5 percentage points from the end of 2008, while new competition over the same period has erased nearly 5.5 points of Opera Mini's share. Mobile phone leader Nokia has lost about two points of share among mobile browser users. New WebKit browsers for RIM and Android phones have enabled those platforms to make dramatic gains, with BlackBerry eating up nearly 9 points of new mobile browse share while Android has grown by over 13 percentage points. That growth has come largely at the expense of "other" mobile browsers, including Microsoft and Palm, a figure that has collapsed by nearly 12 points over the last nine quarters. Growth curves over this period indicate that these shifts are now slowing down, with all of the major mobile browsers settling into minimal changes over the last quarter. Apple reversed its downward trend beginning last summer, a change that mirrors the launch of iPhone 4, and is now slowly growing upward again. Opera mini has erased the gains it had made since early 2009; Nokia has continued to slip downward; RIM's growth peaked last fall and has since shrunk back to its share from the first half of last year; while Android's rapid growth throughout 2010 has since flattened out. Again, StatCounter Mobile numbers here only pertain to iPhone users. iPod touch figures among web visitors have been declining overall as a share of all mobile browser use since late 2009, with seasonal rebounds occurring alongside holiday iPod sale surges. In March, iPod touch took an additional 6.09 percent share of mobile users in addition to the 18.18 percent share claimed by iPhone, creating a combined iOS platform share of handheld devices that was well ahead of Opera Mini, even without counting iPad use, and nearly ten points ahead of Android's browser (for about a 60% larger installed base). This means that despite large sales of Android handsets, among web browsers, Apple's iOS is clearly remaining the dominate mobile platform. This mirrors Apple's native app business, which is far larger than any other mobile platform in both numbers of titles and revenues generated. A report from February indicated that Apple continues to own 82.7 percent of all mobile software sales with its iOS App Store. While Android's year over year "percentage growth" in app sales was up an impressive 861.5 percent compared to Apple's 131.9 percent growth, Android's software revenues actually grew by $91 million over last year, while Apple's App Store grew by a whopping $1,013 million, more than 11 times as much real growth in terms of revenue dollars. Handset sales by all Android licensees combined were higher than Apple's in 2010, but that did not result in greater app sales nor even in greater web use by Android users. Dynamic growth among new iPhone competitors in 2009 and 2010 is now maturing, even as Apple rapidly expands its market share among mobile devices with the fast growing iPad and stable iPod touch, two product categories that smartphone makers haven't been able to successfully challenge. RIM hopes to enter the tablet market with its Playbook this summer, while Google has closed the source code of its Android 3.0 Honeycomb project to focus on making it a credible competitor among tablet devices as its licensees return to the drafting board to redesign more competitive hardware after a faulty start by Motorola's Xoom and Samsung's self described "inadequate" initial design of its Honeycomb Galaxy Tab. HP and Microsoft licensees will also bring new tablet devices to market later this year and next year, although increasing numbers of analysts are describing the rush to build tablets as a bubble that may not support the aspirations of all the players involved, just as previous efforts to duplicate Apple's success with the iPod failed to materialize. Apple has continued to remain a tough act to beat, with aggressive pricing and hardware improvements, a heavily promoted edge in functionality and third party app support, and a lead in HTML5 browser savvy that web development firm Sencha described as "a top rate, no compromises HTML5 browser" in contrast to calling Android 3.0 Honeycomb "not ready for primetime, even for HTML4."